Earlier this week, Spokane Transit Authority made the official announcement that they would be starting work on replacing all the old bus stop signs in the area with a completely brand new design. In that announcement, it was mentioned that the bus stops haven’t seen any sort of major update in more than 30 years. I thought that this would be a good opportunity to take a look back through those past 30 years and even beyond. Before STA was established, the city directly ran the predecessor agency Spokane Transit System. The STS name has been gone for more than 30 years now, but a trained eye can catch a couple of remnants from that era in Downtown Spokane, as seen at left. Before STA took over in 1982, STS made a major change to downtown bus stops in 1980 by instituting a new color-coding system. (“New bus fare hikes, stop changes approved” Spokane Daily Chronicle November 25, 1980) Rather than having every single bus stop every block, STS created a sort of interchange hub in the middle of downtown, where every bus would have their main loading zone next to other routes, which made it easier to transfer between routes. 9 different colors were used to differentiate the different bus stops. It’s unclear how long this system lasted though. However, it is worth noting that a small remnant remains today with the current color-coding system used for individual route schedules. It was around that same time in 1983 that the plain blue bus stop signs we’re so familiar with started to pop up. It’s hard to pinpoint an exact timeline on this, but an old blurb from March that year in The Spokesman-Review mentions the installation of these new signs on East Sprague between Division and Havana as part of an effort to ease traffic congestion. Finally, we come back to the new bus stop signs. There’s still some blue on the signs, but it’s not very much. Instead, these new signs use the same colors as STA’s livery, incorporating the same distinguishable swooping design. It’s a clever move on STA’s part, as no other entity uses colors or graphics close to their design. The white base alone makes the signs so much more noticeable, especially from afar. 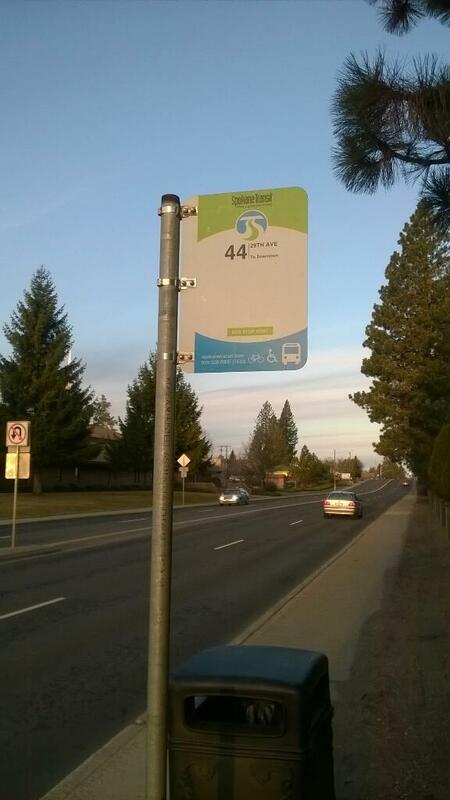 You may also notice a bus stop number on the sign, which is a new feature for STA bus stops. That number will be used in the near future when STA debuts their real-time bus tracking system. A specific timeline for finishing the installation of these new bus stop signs hasn’t been mentioned, but given how fast the signs are popping up already, I think it’d be fair to say all signs should be in place by the start of summer. Well researched post! For the press release the question was asked when the blue bus stop signs began to appear in Spokane. Our research drew us to the November 1983 minutes of the STA Board wherein the Board approved a contract with the state department of corrections for another batch of signs and indicated that the agency was busy installing signs prior to the meeting. We also have an agreement with the city dated that year for sign installation and routine maintenance. So we were pretty confident in citing “more than 30 years ago” as the age of the old sign design. 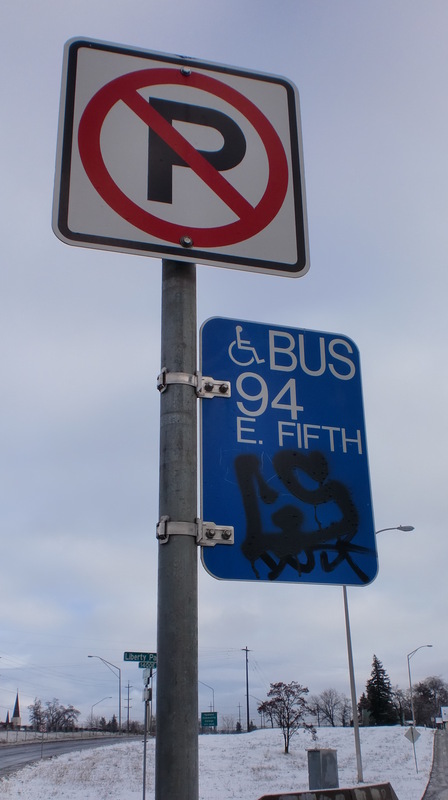 The 1998 signs were essentially the same size and color but since all route numbers and many names were drastically changed that year (biggest numbering change since route numbering began in Spokane in 1945). Over the 30 years of use, the blue bus stops signs saw some changes, with the addition of the website and the ADA accessible pictogram as the system became fully accessible. 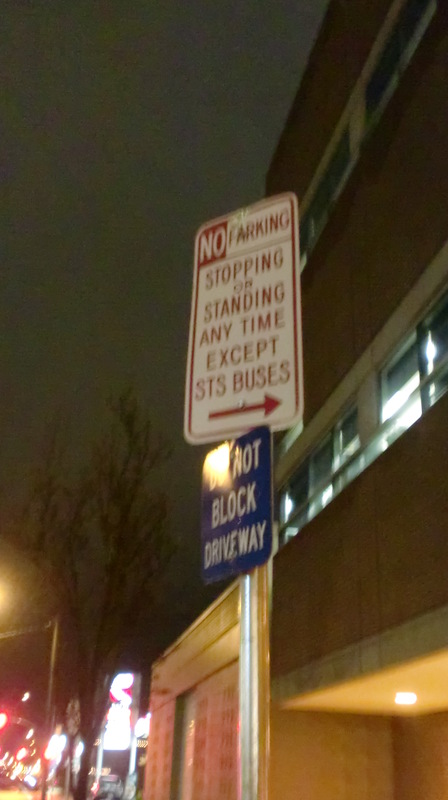 At some point in the design project we uncovered a contract or procurement that was done by STS in the 1970s for long, skinny signs that simply said “bus stop” with the text reading vertically. I’m not for certain if that represented the very first signage project. A 1950s report reported in the Chronicle provided to the City by a New York City-residing transit expert recommending bus stops signs throughout the system. Prior to that time and possibly as late as the 1970s, every near-side corner would have been a bus stop. Last thing to point out is that customers don’t have to wait for real-time schedule information to use the bus stop numbers. Call 509-328-7433 today and you can look up schedule information for a specific stop. I tried it this morning and it worked great! Its amazing the city parking signs still read STS and Spokane Transit System buses, when I was in Spokane a couple weeks ago (and for the first time in a long time got some pictures of STA buses) I noticed this driving through downtown. These new signs are so much more informative, and they look really good! It’s too bad they’re taking their sweet time to install them. I figured the 90 would be one of the first routes to receive them since it’s such an “important” route, yet it’s September now and not a single one has been installed along that route. I hope this doesn’t end up like the freeway project, half-finished and then abandoned for many years!